Welcome to the website of Yvvette Edwards. You’ll find information about the author, her writing and other miscellaneous bits and pieces, and are invited to make yourself comfy and have a leisurely browse. Yvvette Edwards was born in Barnet and grew up in the London Borough of Hackney. She continues to live in East London with her family. Her favourite hobbies are reading and those things that perfectly accompany a good read, including travel, long baths and lounging in the garden with a glass of wine. She is a lover of stories of all kinds, and can sometimes be spotted frequenting the cinema and theatre, or wearing sunglasses and crouched low in shady corners suited to eavesdropping. Her first novel, A Cupboard Full of Coats, has been described by her mother as ‘the best book I have ever read.’ It was nominated for a number of awards, including the Man Booker Prize 2011. 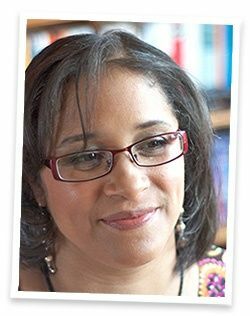 Her second novel, The Mother - published in the UK and the US in 2016 by Mantle and Amistad, respectively - has been described by Yvvette Edwards’ husband as ‘one of my top two all-time favourite books’. Though the author has a preference for old index-card systems and matching writing pads and envelopes, she can be found on modern social media platforms including Facebook and Twitter. She is currently in deep thought, mulling over the characters and plot for her third novel.